ITV currently operates the largest family of commercial channels in the UK. Defined as an “integrated producer broadcaster”, the company delivers an extensive range of on demand content through numerous platforms alongside its traditional television operations. ITV also produces programmes for its own network and third parties across the globe through its production arm ITV Studios. Similarly its distribution business manages the sale of finished shows and programme formats worldwide. In 2010 ITV embarked on an ambitious programme of content delivery modernisation. The goal was to embrace emerging technologies and file-based processes in a timely and efficient way. If it was to be successful the project would need to overhaul the way the company delivered content for multiple platforms. In 2013 Cantemo Portal™ was selected for the initial pilot deployment. The new in-house workflow has been so effective that if you watch ITV today, every pre-recorded show, no matter the screen, will have been managed at some stage by Portal. When the project was launched the ITV content delivery modernisation project team identified a very clear set of issues around content delivery. At that time the internal capabilities for file-based workflow were zero and ITV outsourced delivery to third-party providers. The level and pace of the company’s transformation also meant it was challenging to accurately gauge requirements, especially the volume of deliverables that would be needed 6 months, 12 months or 18 months into the future. Historically large broadcasters have addressed problems of this nature by engaging internal resources to develop bespoke tools. The complexities of such a task should not be underestimated however and the associated costs of this approach can quickly become overwhelming too. Therefore, ITV resolved to implement a mixed economy of buying and building services to complete the task using the most efficient methods. From the outset there was a clear understanding that the sophistication of standard off-the-shelf products could readily fulfil a number of the project requirements. Determined to “buy what you can” whenever possible, the modernisation team were careful to manage their own expectations when evaluating software. They found that the key was to find solutions that offered the majority of the functionality they required. Anything above that was deemed unrealistic and if the team couldn’t find a commercial product that provided the functionality ITV required, then it was the expectations and scope that was put under review. It was this approach that brought ITV to Cantemo. The strength of Cantemo Portal including the Vidispine backbone was a key factor in the adoption of the solution. By working this way the team was better able to manage costs, be responsive to external changes and create a solution that is able to scale with each new demand. To bring the file-based delivery services in-house ITV needed an asset management solution that would support a fully integrated system. As the intention was to craft a solution from a number of vendors, Cantemo Portal would need to work with a range of different broadcast technologies. The ITV content library of large AVC DPP masters sits on an Isilon storage array with capacity that currently exceeds 1 Petabyte. Requests for content are generated by internal scheduling systems. These are passed to a NATIV MIO workflow engine, which then triggers Portal (via Vidispine API calls) to transfer media to a Telestream Vantage transcode farm for processing. The resulting files receive a final QC pass before they are delivered, typically via Signiant or Aspera, to the appropriate VOD or broadcast partner. 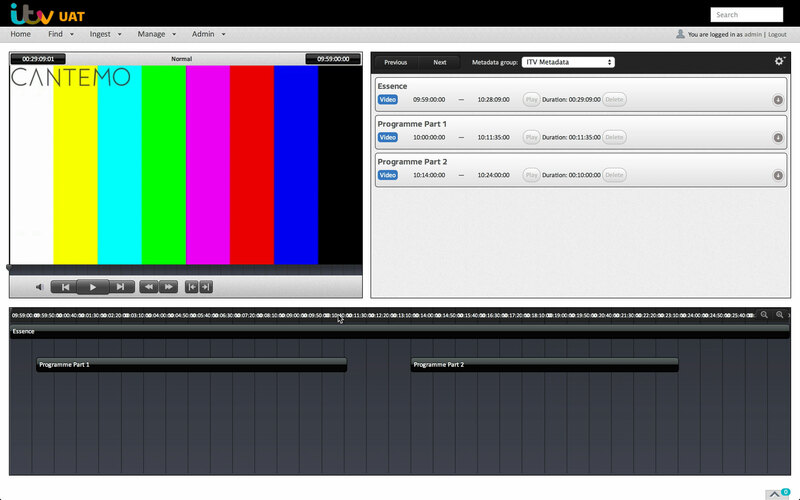 ITV have also been able to leverage Cantemo Apps, such as the Annotation Tool to automate workflows. Currently the DPP data centre generates time-based annotation metadata for programme files. The annotations are used to provide an EDL to the Vantage transcoder cluster. The transcoder automatically edits content from a “broadcast structure” (files that include bars and tone and clocks) to the required “VOD formats” (segmented programme parts). By working closely with integration partners, NMR, the modernisation team at ITV has leveraged Cantemo Portal Enterprise licensing to deploy the software in a highly available cluster configuration for redundancy and failover. Portal and Vidispine utilise a range of open standard technologies to provide an environment that will be familiar to experienced system administrators. This means the solution tends to fit well with existing IT infrastructure and the toolset for augmenting functionality, or adding new features, is easy to embrace. Overall Portal is proving to be a robust, reliable and responsive solution for ITV. It provides the right ratio of core functionality and scope for the content delivery modernisation team to build on. Now, instead of delivering 20 hours of content to 4 partners, ITV manages the delivery of approximately 300 hours of content directly to 30 different platforms across catchup and archive every week. The ITV approach for this modernisation project is perfectly in line with our vision of Next Generation Media Asset Management systems. One size does not fit all as has been proven time and time again, but fundamental core functionality meets the needs of the majority and together with ease of adding open-ended customisation for those specific customers is a key differentiator that Cantemo Portal offers. We are proud that ITV has put their trust in our solution and we are looking forward to the upcoming phases of this significant project. 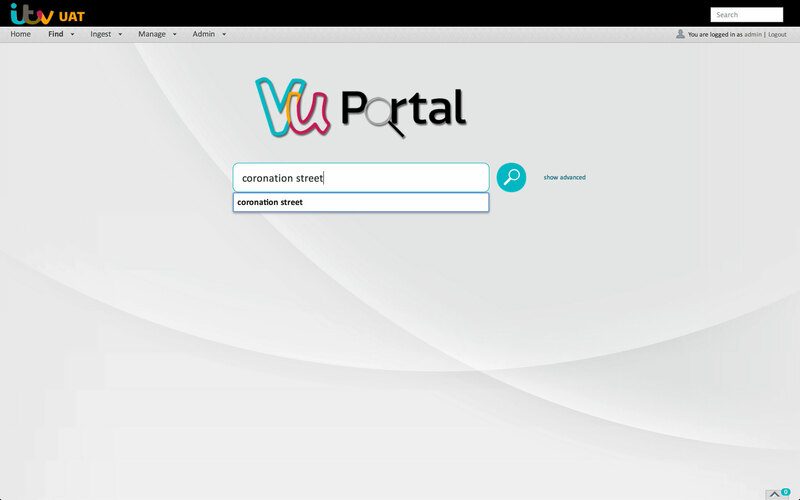 One of the most striking aspects of the Portal deployment at ITV is the custom theme the modernisation team created for the browser interface. ITV remain impressed with the design, feature set and overall ease-of-use of the standard core theme. Indeed features like the scrubbable thumbnails and the Recycle Bin have proved enormously popular with the end users. 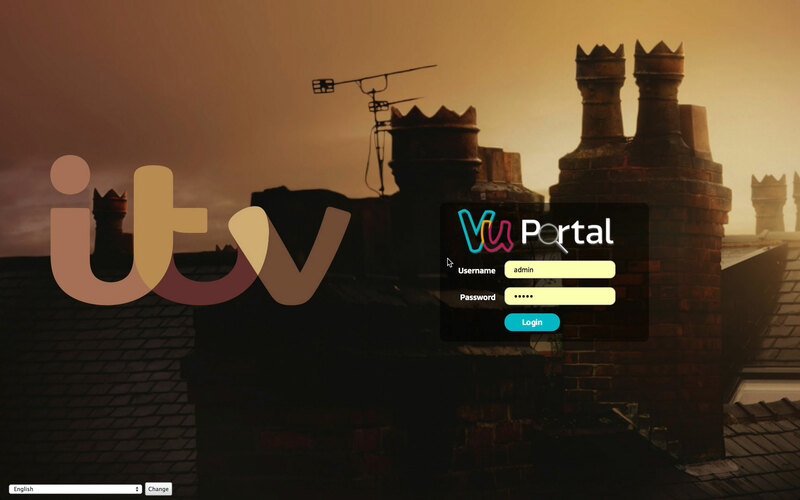 However the look and feel of the ITV Portal has been modified to conform to the internal style guide. To all intents and purposes Portal has the appearance of an ITV application. Tor a large organisation like ITV, the ability to change the interface is important. It helps make Portal more familiar in appearance to other tools that users work with. That in turn reduces the scope for training and removes a barrier for widespread adoption. As the deployment begins to move into other areas of the company this will prove hugely beneficial in both cost and time savings. The work involved in theming Portal is also emblematic of other developments the modernisation team have undertaken. The standard interface meets the majority of their requirements, the custom theme was a relatively minor change, that consumed a minimal amount of resources. By focusing development on a small part of a larger system, the team is able to add a “micro service” to augment existing functionality. Elsewhere development is often limited to simple additions, where the team is required to create the “glue” between systems or provide translation to ITV-specific logic. Usually this results in projects that are less than 1MB in code. As ITV reflects on a successful transition, the content delivery modernisation team are satisfied that the project has delivered key functionality. This is attributed to the process they followed. Laying the right foundation and defining a sensible scope has paid dividends. Selecting partners like Cantemo and Vidispine, to provide off-the-shelf solutions has provided the right balance between commodity and customisation. Such relationships have meant ITV resources can be focused on the most appropriate tasks, selecting a sensible order to tackle each job. Today the modernisation project is delivering the benefits the team proposed and doing so in a cost effective way. Currently 90% of transmission is fulfilled by DPP Files and ITV carry out 100% of all transcoding required. The demands on the system are great but Portal is proving to be more than up to the challenge. NMR is very proud of our partnership with ITV. As the content modernisation project transitions to the next phase of expansion we will continue to provide system integration services (including HA setup), on-going SLA-backed technical support and workflow advice. We are confident that Cantemo Portal will continue be a critical element within ITV’s plan to entirely centralise and manage their tapeless broadcast and VOD workflows. NMR is a leading post-production and broadcast systems integrator. With an established client base that runs the gamut from tier one broadcasters and in-house production teams for some of the world’s largest corporations, through to specialist boutique facilities, NMR is focused on developing comprehensive solutions for storage, post-production and play out of digital film and video content.